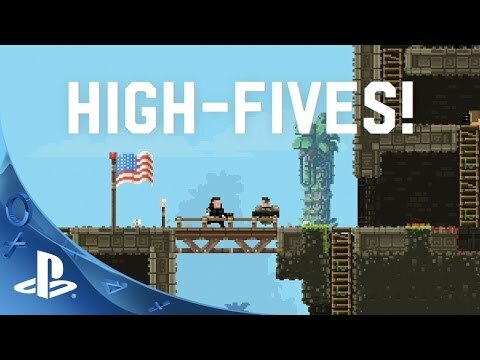 Broforce is going to be launching on Playstation soon! Broforce, along with 2 other games, are competing with each other to be a PSN free game in March. 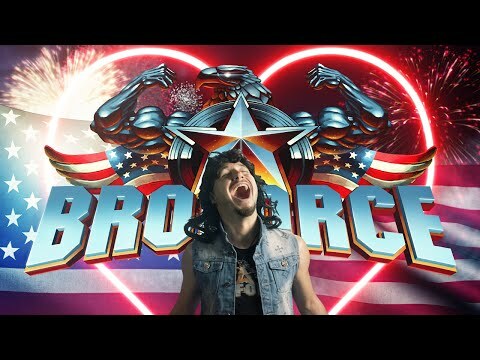 Here's a "Vote For Broforce" video that Cool Your Jets made for us promoting the "Vote To Play" PSN vote. If it gives you the impression that Free Lives are a bunch of idiots/cultists, well then that's pretty much what we were trying to achieve and is a fairly accurate reflection of reality. Mostly just wanted to say: Awesome work @BenJets !!! Really awesome video especially the gameplay! I think the people talking looks a bit lame (no offence, just honest) but the dog + gameplay was epic! Yeah, vocal minority and such. IMO this game is so well suited for console. In the office it is super awkward plugging in 4 wired Xbox controllers. It makes lots of sense to have it on console in the living room for when friends come over. I did just buy the wireless Xbox controller thing that lets you pair 8 controllers, but I'd still love it on Xbox One. Out of interest, and I'm guessing you probably can't say, how does money work with PSN free games? Do they pay you a lump amount, or maybe x% per free "sale", or neither of the above? Also remember that there's a lot of visibility granted by this sort of thing, especially if your game is going to be played after the free promotion and converts well when seen/played by friends. So there's a sales upside to this as well, it's very unlikely that your entire market is going to get the game during the free promotion, resulting in lower or zero post-promotion sales. @roguecode For the games that go free on PSN, Playstation pay a lump sum. It's a pretty good deal, because a lot of people then play the game, which is great for building awareness for future games. The crappy thing, what I think will be unenjoyable, is that, because it's free for everyone, a lot of people who won't like the game will pick it up. But on top of that these players feel like they paid for it (it wasn't free for them). So I'm expecting a much more tepid response, and even some hostility. There will definitely be people who enjoy it. But I don't expect a launch nearly as pleasant as the one on Steam. Thanks for the answer @EvanGreenwood! "The Ballad of Rambro" was awarded "Most Innovative Advertising for a Video Game" at the Golden Trailer Awards! Massive congratulations to South African musician Deon Van Heerden for composing and performing the song (along with other members of Strident). And also congratulations to JM "The Face Of Broforce" Specht and Kert "Golden Trailers" Gartner as well as Devolver Digital. Congrats on the video being most innovative! I just checked the trailer again and I now understand why it was so weird. If I am not mistaken this ad is 100% targeted on the American audience on getting them proud to be an american and buying the game? Would like to know the reasoning behind choosing the type of trailer that you guys did. I'm in love with that video. It is the perfect parody of the America that the game is parody'ing. @Zaphire To be fair, it wasn't the only trailer we did at launch. 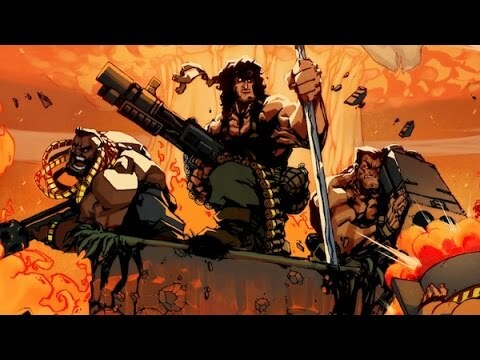 And Deon van Heerden (the guy who did the music for Broforce) had already composed the song when the trailer for "Ballad of Rambro" was conceptualized. Like @roguecode mentioned, while I think some people who love America may have enjoyed that trailer, a lot of people who don't love America, but think loving America is funny, may have loved that trailer. This is a bit of a having our cake and eating it approach. We wanted to attract both the people who love America and the people who think the people who love America are funny. I'm not too sure where it fell at the end of the day. As it happened, pretending to love America is a kind of fantasy-enactment that people enjoy doing. So it's often impossible to tell who is being serious and who is taking the piss when you look at the patriotic comments (about this video and about Broforce in general). I think pretending to be patriotic is one of the pleasures of Broforce (though not the most obvious pleasure). Making trailers which let people assume and act upon a false reality (like pretending to be patriotic) is a weird sort of place to have landed. @EvanGreenwood Awesome feedback thanks! Ye I like the variety of trailers you guys do but the one's that I find personally the most effective is the gameplay videos! The other videos seem more like something that adds a "coolness" factor to the game where the gameplay videos are more a direct approach to sell the game. Who is the guy singing in this video? @Zaphire JM Specht, who is an actor and works with Devolver regularly, is the face (and he has pretended to be us at a few conventions). The voice for "The Ballad of Rambro" is Deon van Heerden. Local music extraordinaire. Adding "coolness" can be a useful thing a trailer does. Of course communicating what the game is is the kind of trailer that best serves the consumer. But because we'd already done something like 8 gameplay trailers it made sense to spend effort on building the brand rather than explaining the game. (That was the reasoning anyway, it's a little hard to judge, but it seems to have paid off). Even with our gameplay trailers we weren't 100% communicating clearly what the game was. In some senses we were trying to put a piece of media out there that would resonate strongly with people who would enjoy Broforce strongly, and our loud and frankly confusing gameplay trailers would alienate most people who either wouldn't enjoy the game, or would only partially enjoy the game. Which probably is why our user review score on Steam is so high.